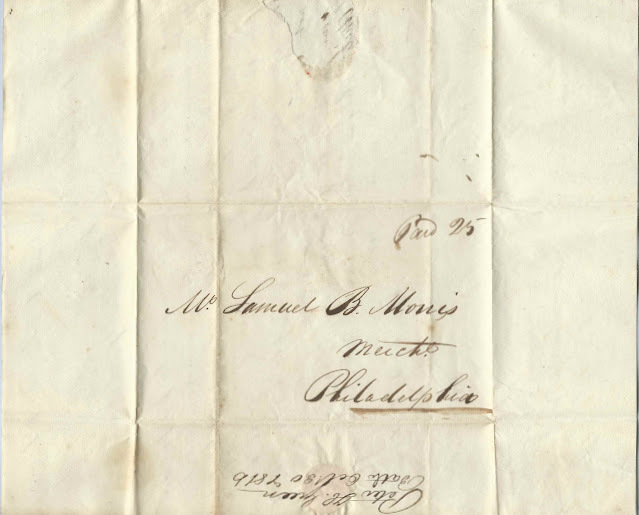 October 30, 1816 letter from Peter H. Green, or Peter N. Green, of Bath, Maine, to Samuel Morris at Philadelphia, Pennsylvania. The letter concerns prospects on the island of Curacao. On the address side, the middle initial appears to be H, and I found records for a Col. Peter H. Green of Bath. On the correspondence side, the initial looks more like an N, but could be an H, and I found a listing for a stone at the Maple Grove Cemetery at Bath, Maine, that includes the name Col. Peter N. Green. 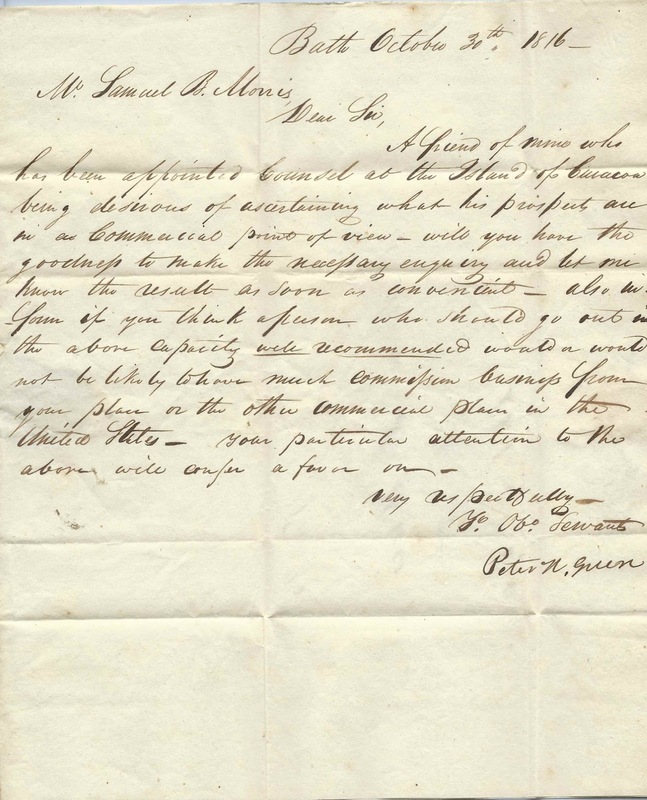 Chiefly papers of/or relating to Peter H. Green, lawyer, shipbuilder, banker, customs collector, sheriff of Lincoln County, and resident of Bath, Me. Includes miscellaneous bills for goods and services (1825-1837); accounts of/or relating to various vessels including Palalox (1823), Portrait (1828-1829), Carpenter (1824), Hannah (1825), Retrieve (built 1817), Jane Carlton (1825, 1828), Paramount, and Thorn; documents pertaining to several court suits and actions in which Green was involved; custom collector's certificate (1835) for duty paid on Indian moccasins imported from Canada; and miscellaneous business bills and receipts. Gardner Green, shipbuilder, also of Bath, and some other family members are also represented in the collection. Either Peter N. Green and Peter H. Green are the same person, or perhaps father and son or other relation; hopefully a reader will weigh in. I found an online reference that Curacao returned to Dutch control in 1816, which may have been the occasion of the appointment of a new consul. 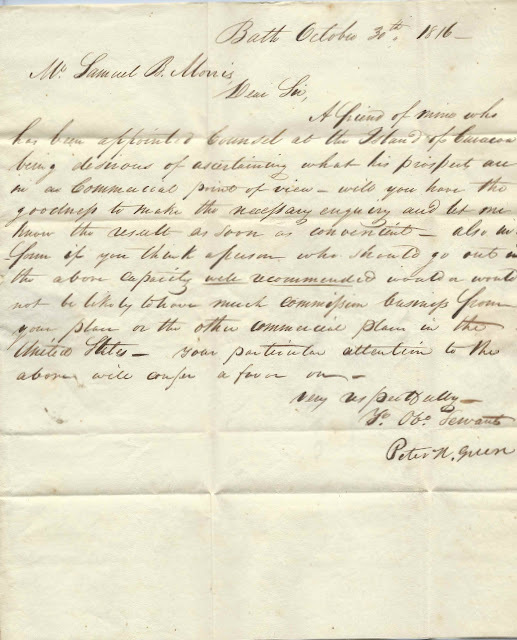 The consul from 1816 to 1817 was Abel Boynton of Massachusetts, presumably the Abel Boynton born about 1783, possibly at Westford, Massachusetts, son of Minuteman Abel Boynton and wife Polly (Abbot) Boynton. The younger Boynton was a lawyer at Bath, Maine, and would have been an acquaintance of the letter writer. 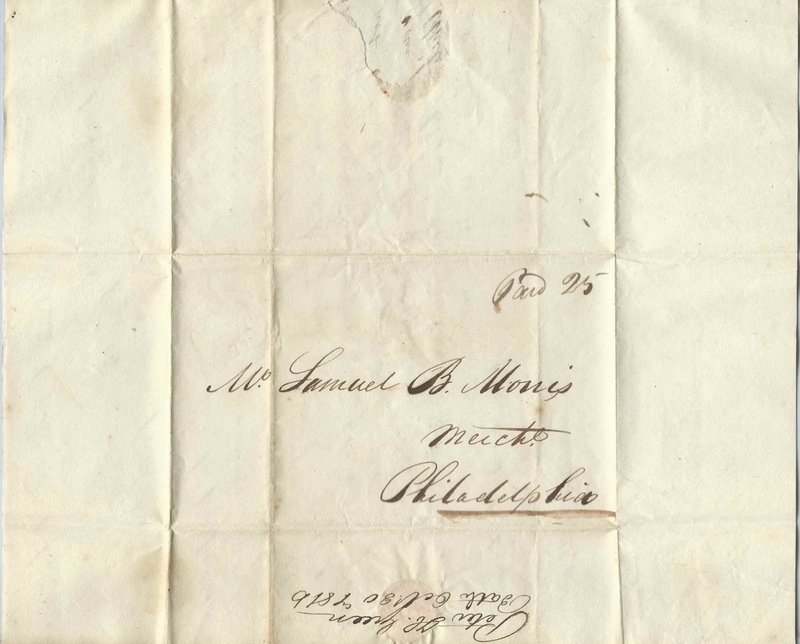 Samuel B. Morris may have been Samuel Buckley Morris (1791-1859), who married into the Perot family, which had interests in the Caribbean. If you have more information on Peter H. Green and/or Peter N. Green, Abel Boynton or Samuel B. Morris, please leave a comment or contact me directly.